In the blogging world they say you should never skip a post but I sure don’t feel like writing today. So forgive me if my post seems out of sort. The last 11 months have been a world wind for me with traveling a lot for work and dealing with the estate. I have been praised so many times as to how well I have handled everything since his death. Honestly, at times, it was just smoke and mirror. There are times that I felt like I was falling apart. There are times I wished that the world would stop spinning so I could get off. There are times I wish that I could turn the clock back. There are times that I’m so numb that all I can do is keep moving one foot in front of the other just to get through the day. I have never been an emotional person but in the last 11 months, I’m learning that it is okay to cry but I still can’t do that in front of anyone. This is the main reason why I kept turning down the offer to free room and board for the next 7 months before I hit the road because I need a place where I can be by myself and not worry about being strong. Old habits are hard to break. Remember the holidays are just around the corner and so is the year anniversary of his death. So there may be days where I’m a little off or withdrawn, please don’t worry, I’ll be fine and will weather the storm that is ahead of me. I just need time and space to get through the emotional storm. Thank you for letting me unwinds here and for being patience with me. Today is just one of those days where the compass is pointing south instead of north. I know this too shall pass and to take it just one day at a time. Unwind, wind down, whatever you need….you can only do what you can do….hang in there. Thank you Linda. Someday I will be comfortable doing it in front someone. This one thing that Russ and I are very much alike in dealing with our emotion. Love you too! Be well. 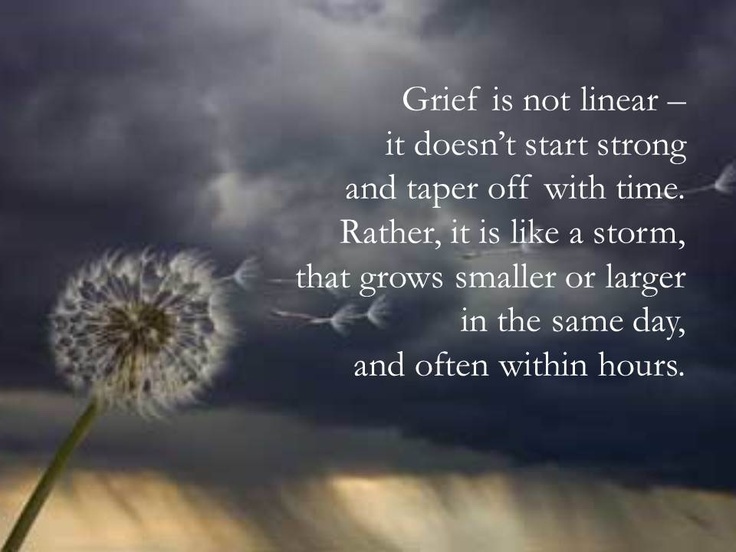 There is no ‘right time’ or ‘right reaction’, every person handles grief differently. Thank you….just taking it one minute at a time, one hour at a time, one day at a time. I fully understand the need for solitude, do what you need to do. I do not know you and only stumbled across your blog by accident. Still, I admire the way you are handling the tough hand you’ve been dealt. I admire you a lot. Keep handling life one day at a time. I will pray your days get easier and that you catch a break. Thank you for your thoughts and prayers. Also thank you for taking the time to read my blog anyway when you stumbled upon it accidentally. Sometime things happened for a reason.